Creating is joy, whether we doodle while on the phone or happen to be Leonardo. 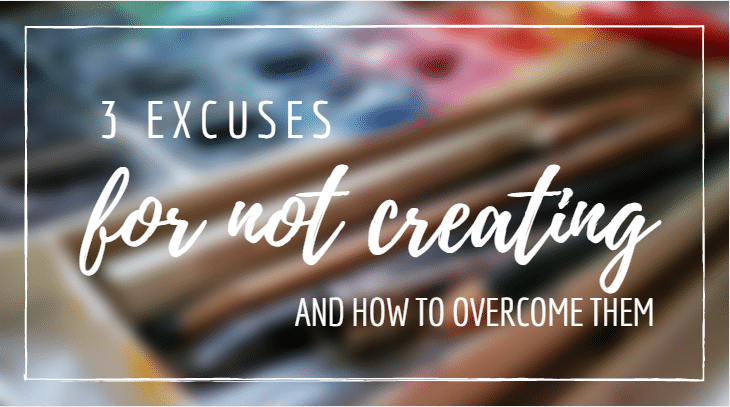 We all know this, but for some reason we prefer to hide behind excuses not to take the pencil in our hand. I’ve decided to demolish the greatest ones of these excuses. The world will love to put this banner on you, that you are not talented enough, but of course this is rubbish. I mean, you don’t need to be talented to grab a brush and paint a bubble, do you? Creating – regardless of talent – is joy. So forget about talent for a mome, and just draw lines, paint bubbles, the point is making a “mark” on the paper. Or the canvas. Or whatever medium you choose. The point is to use your hands and enjoy being offline for a sec. You have a paper and a pencil in your hand and you are looking out of the window dumbly? Well, my sweet, go online and do research. If you have a pencil in your hand, you might want to search pencil drawing. Believe me, 10 mins on Pinterest and you’ll be bursting with ideas. I suppose some will kill me for saying this, but it is okay to copy. Through copying you can get to know your medium better without worrying about the outcome. They won’t be real artworks (and it is definitely not okay to present them as your own), but they may help you come over the nonsense people tell you, that you cannot draw a single line. This is the one I’ve been struggling with most. Grabbing a paper, some brushes, my watercolor kit and a mug of water takes about 2 mins, yet it feels like a whole ritual (actually it is a ritual, but definitely not a time-consuming one). However, you can come over this by creating small stuff first. A postcard-size painting takes me half an hour, and painting a bunch of smudges will take like 10 mins and will look cool. It feels good to finish something so quickly (later you might see the beauty in finishing one leaf of a bouquet of flowers during one session and continue on the next, but that’s not so satisfying at first). Undoubtedly you can switch your geers off better if you have at least an hour, but believe me, 10 mins of doodling is better than 10 mins of facebook.